Until the Renaissance, any knowledge about geology was almost entirely built around scholastic reasoning, with the earth assumed to be the perfect creation of a divine being. Models of the earth followed ideas proposed by the Ancient Greeks, largely fitting around the elemental view proposed by Aristotle, where the earth lay at the center of the universe surrounded by spheres of water, air, and fire. Very few scientists actually studied rocks or tried to determine where and how they arose, and most scholars believed in Aristotle’s idea that rocks evolved and changed over time, seeking to become a perfect element like gold or mercury. This idea of the evolution of metals and minerals was a foundation of alchemy. The Renaissance slowly changed this view, as empiricism and experimentation gradually began to supersede the old beliefs. Scientists started to study the earth and its ancient rock formations, understanding that this was one of the keys to developing a picture of the universe and learning why things happened. The astronomers, Copernicus, Kepler, and Galileo certainly inspired much of the new way of thinking: If the earth did not lie at the center of the universe, then it was reasonable to assume that it was not perfect and that it was worthy of further study. Renaissance geology overlapped heavily with alchemy, especially in smelting and metallurgy, where geologists attempted to understand the distribution and nature of metal ores. This practice would eventually lead to large-scale production of metals and allow the industrial Revolution in England, an upheaval based around the ready availability and relatively easy production of iron, shifting the focus of humanity away from precious metals, although gold and silver would still inspire greed. 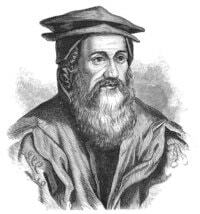 One of the most notable Renaissance geologists was Georgius Agricola (1494–1555). He hailed from Saxony, in Germany/The Czech Republic, studying and teaching in Leipzig before studying medicine and natural history in Northern Italy, the heart of the growth in Renaissance knowledge. He was a physician and general scholar in Chemnitz, renowned for breaking away from dogma and developing his own ideas about medicine, including advocating quarantine for certain illnesses. However, he also had a passion for mineralogy and metallurgy and he contributed six books about geology. He wrote his first book, the Bergmannus, an introduction to mining and mineralogy, before scribing his two great works on geology, De re metallica (1556), a book about smelting and metallurgy and De natura fossilium (1546), a treatise on mineralogy. Agricola advocated classifying minerals according to their physical properties, such as color, transparency, and hardness. Importantly, he shifted mineralogy away from alchemy and divinity, merely documenting what was actually there, although he was unsure about how to classify fossils, believing that some grew within the crust of the earth. His classification of metallic ores and their distribution would be of huge importance to the growing industrialism across Europe. De Natura Fossilium (1546): In this book, Agricola classified his observations of the various minerals. Although he had no idea about the chemical composition of the minerals, he used color and hardness, amongst other attributes, to group them into categories. The major outstanding feature was that he performed a literature review of ancient sources, including Aristotle and Pliny, and he was prepared to reject any ideas that he did not agree with. In this respect, he was one of the first scholars to shift towards observational science rather than relying upon theories and the scholastic approach. 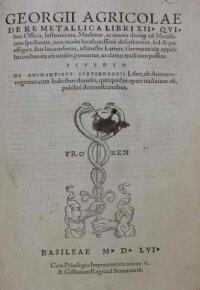 De Re Metallica (1556): This work, published posthumously, was an in-depth guide to mining and mineralogy. It covered a broad spread of topics, from mining laws in his native Saxony, to finding and refining ores. Again, he reviewed classic literature, but he also used his approach of rejecting literature that he felt was incorrect and without foundation. Agricola included sections about the physical process of surveying, constructing, and operating mines, and he also included techniques for refining and smelting ores. The Swiss scholar, Conrad Gessner, was a skilled zoologist who made some excellent contributions to the fledgling field of geology. His book, On Fossils, Stones and Gems, looked at stones, gems, and fossils, and it was an extensive guide to the most common types. He did not really make any distinctions between fossils, gems and stones and, in fact, he used the term fossil to define all of these in the process of creating an excellent classification guide. He tried to categorize them according to the complexity of forms and he continued Agricola’s remit of attempting to remove the supernatural and the occult from the study of the earth. 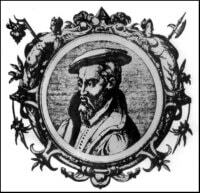 Famously, he studied Glossopterae (tongue stones), which would be further studied by the anatomist, Nicolas Steno. Leonardo Da Vinci (1492–1519), the epitome of the well-educated Renaissance Man, made contributions to geology as he did in many areas of science and the arts. 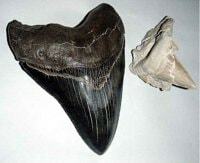 In 1508, he attempted to explain the occurrence of fossils found on the seabed and he rejected the ancient ideas that an unseen force shaped these objects in the earth’s crust. As an alternative view, he proposed that they were the remains of creatures found at sea and buried, developing the controversial idea that this was not because of the biblical deluge still followed by the church and Biblical literalism. He did not follow this idea up, but his notes show that this was his thinking: Whether he failed to publish his findings because he had no interest or because he did not want to make such a bold statement against church doctrine is unclear. This fate also befell Girolamo Frascatoro, who also proposed this idea but did not pursue his theory. Bernard Palissy, in 1580, also believed that the remains of animals had become embedded in the crust, but he did not explain how they got there. Ulisse Aldrovandi (1522-1605) followed the work of Da Vinci in paleontology and studied fossils in great detail. In his great work, the "Musaeum Metallicum" published posthumously in 1648, he classified and described hundreds of fossils found in rocks, soils and resins. He was a believer in observation as the basis of research, but he also understood that he had to make connections and test his ideas. Aldrovandi decided to compare the anatomy of fossils with living animals as a way of proving that fossils were indeed the remains of long dead animals. He also compared holes found in ancient rocks with the work of burrowing mollusks and concluded that these rocks must have been subjected to the same process, an area that he devoted much study to. Aldrovandi had no explanation for the fossils that borer little resemblance to modern animals, speculating that they were an inorganic artifact created during the formation of rocks. His ideas were not accepted by the mainstream until long after his death and, because of his challenge to the creation myth, he spent the last years of his life under house arrest. These geologists laid the foundations of geology as we know it, but it was the scholar, Niclas Steno, who would take these ideas and refine them. He devised laws of geology that had the same impact upon earth science as Newton’s laws did to physics. In a short career, he changed how humanity understands the earth beneath our feet.